Product Description: Inactive forms of B-Vitamins require conversion in the liver before they can be used by the body. 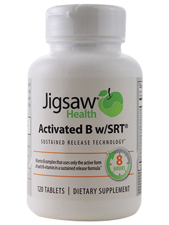 Activated B w/SRT provides only the ready-to-use, active form of each B-vitamin, so no conversion is needed, in a timed release formula. This ensures they are fully absorbed and utilized throughout the day. Additional Info: Should not be used if tamper evident seal is broken. Store in a cool, dry place. Suggested Use: As a dietary supplement, take 1 Tablet daily, or use as directed by your healthcare professional.